HomeBlogWhat happens to your direct sale when Booking.com is removed from metasearch engines? 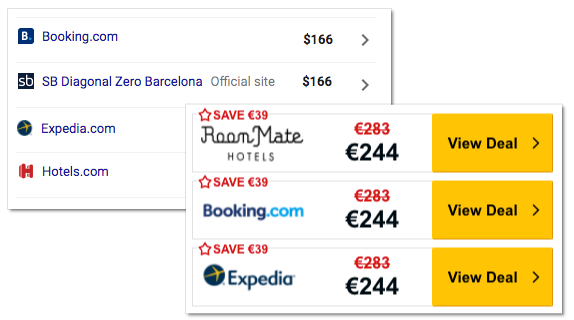 If your hotel is investing to take your direct sale to metasearch engines, you should seriously think about the presence of OTAs in them who are constantly bidding and almost always on top thanks to their huge budgets (funded mostly by you and your commissions). What if we try to get Booking.com, Expedia and the rest of OTAs removed from metasearch engines? The famous slogan, although one already stamped out by OTAs themselves, “I will take you wherever you can’t go alone” does not apply here. The presence of OTAs in metasearch engines does not provide added value for you if you are also there directly. However, what would really happen if we got rid of Booking.com from metasearch engines? At Mirai we tried and measured it, and here are the results. We found a deficiency in the integration of Booking.com in Google Hotel Ads in which, when the hotel did not have available stock for two people, Booking.com sent the price of a single room to the client and later notified him that he had to book two different rooms. A small mistake (or a trick, perhaps?) 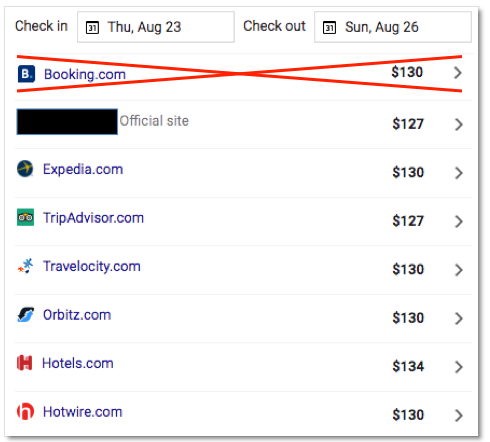 which at the time allowed us to exclude Booking.com (and Priceline.com) from the Google Hotel Ads results, something that we did with many of our clients. We did this because Google has a complaints mechanism for integration partners like Mirai which notifies these kinds of incidents, the only of its kind which offers such a nimble service, with response in 24 hours, something which shows their concern about the quality of their results. Unfortunately, this bug has already been fixed, so there is nothing we can do now other than remain alert and continue checking. However, during the 4-5 months that this exclusion lasted, we had the chance to measure how the direct channel behaved when the most powerful OTA which always bids for first position was not in the results of the Google Hotel Ads metasearch engine. Although we excluded Booking.com in over 130 hotels, there was no major impact on most of them. The reason is none other than hotel over-commercialisation, which results in a huge flood of OTAs in metasearch engine results. In those hotels, removing one OTA, even if it was Booking.com, slightly improved the indicators although without causing a relevant impact. Barely had two distribution channels other than their own website: Booking.com and Expedia. Had the price under control and didn’t allow any OTAs to decrease it in any market important to them. 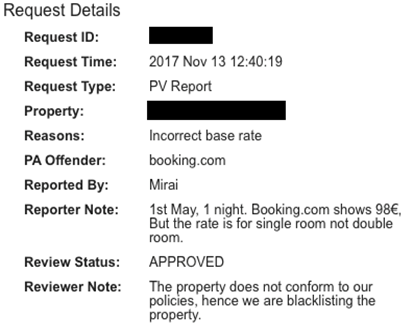 The date that we managed to remove Booking.com (and Priceline.com) from Google Hotel Ads was July 27, whilst its reinstatement was on November 20, when Booking.com fixed its integration error and appeared back on it. Here is the before and after. Since the hotel had few channels, the “Official website” entry almost always appeared (90% of the time approximately). After removing Booking.com, the direct channel appeared close to 100% of the time. Therefore, the hotel gained more visibility with their direct channel. Booking.com usually bids to be in first position, regardless of the cost. Priceline.com, however, used to bid for 3rd or 4th position. Consequently, the “Official website” advert vied for, at best, second position. When we removed Booking.com, everything changed and the direct channel almost guaranteed first position for itself. As well as having more impressions, the official website had the best position in the results. In other words, maximum visibility. As well as maximum visibility in the results, the click-through rate (CTR) figure grew by almost 70%, which resulted in website views from Google Hotel Ads to shoot up significantly. More website views sounds great but were they converted into bookings? It appears to be the case. The conversion of this web traffic was slightly above average. Higher visibility, more clicks and more views ended up generating more direct bookings. Did it reduce the cost of the campaigns? Given that the analysed hotel, which met the requirements of having few channels and a controlled price, participated with a CPA model, we did not get a clear answer. However, hotels with CPC models did show signs of CPC reduction and, therefore, more profitability. How many more bookings? Were they incremental? The blue columns indicate the evolution of booking figures from Google Hotel Ads, although these figures have a strong seasonal component and therefore extracting conclusions is difficult. We can “de-season” these figures by calculating the percentage of these bookings over the total amount. As a result, we see that there was a large increase, going from 3-4% to 7-8%. Therefore, we could come to the conclusion that there was a 4% increase in official website bookings. More official website sales but less overall sales? The final figure that we require is whether removing Booking.com entailed a larger loss than those sales redirected to the official website. After analysing Booking.com sales for this period, we did not see a significant change to the one that had already been taking place. Did this result in a problem with the OTA or penalise its ranking? No. No hotel received any calls from Booking.com nor was any of them removed from the Preferred Programme. Also, no hotel appeared to lose any visibility in its ranking. Avoid over-commercialisation. On the Internet, having two or three OTAs is enough. Having more generates ferocious competition among them and it makes it much more difficult to control what they do on Google AdWords and on metasearch engines. The best price on your website or, in other words, controlling price hacks by OTAs. Having good technology available (website, engine) which allows clients to make a booking in an easy and secure manner. There are some good alternatives out there on the market and some which aren’t. Choose wisely. Therefore, it seems logical to think that removing OTAs from metasearch engines will boost your direct channel, as long as it is integrated in them, of course. The figures just confirm what common sense was telling us beforehand. Are you brave enough to do it? It’s in your hands. While I enjoyed the data collected the test, its conclusion strikes me as being somewhat the master of the obvious. Generally speaking if you reduce competition (especially one of the largest ones) the remaining players will do better (including direct). Also one of the recommendations, while valid is not really possible. “On the Internet, having two or three OTAs is enough. Having more generates ferocious competition ….” The reality of it is if you only contract with one or two OTAs the other OTAs will get your inventory through wholesalers, bed banks etc and they will still be on Meta Search. Hi Dan, thanks for your comment. Very interesting viewpoint. It is the master of obvious. That was what we were looking for. Demonstrating the obvious is not always simple. Unfortunately, thus far, removing Booking.com from metasearch is not a hotelier’s option. I do think hotels can work with just 2-3 OTA in the Internet. Bedbanks are not needed for selling rooms online (they may still add some value offline but are useless online), and you can control the B2B part of Expedia (basically closing it). Therefore, you should be able to control the number of OTA you work with. The problem is hotels are currently working with X OTA and Y B2B, and need to start reducing this craziness. And this is slow and not easy. It’s doable though, and should be done. Metasearch is share shift strategy as you say. Hotels should be able to compete and get the majority of this share. According to some research, OTA get from 20% to 40% of its traffic from metasearch … imagine how big that market is US$! Finding new customers sounds very attractive. However, hotels do not have much impact doing so, and doing so may get very expensive. I’d definitely start with the share shift strategies such as Adwords and Metas. You make great points and the logic sound, but wholesalers and bedbanks are an important part of getting base (especially for leisure markets). These are the types of partners who distribute broadly to other OTAs. There is also the question of the OTA affiliate networks that also feed other OTAs. Regarding sticking with share shift strategy, I really struggle with this. The guest is going to stay in your hotel anyway where you have chance to turn them into a direct booker and you are using funds to “steal” them from your “partner.” I get that that if you do it will you might save commission but what is the break point? Is this the best use of funds? In additon keep in mind that the CPC model usually comes out of the marketing line where the OTA is from the commission line, so by doing CPC meta you are depleting limited marketing funds. Search for 13 Bees Confolens and on the right hand side our business will appear… along with the ability to check availability and book through Expedia and Booking.com BUT NOT THROUGH US DIRECTLY… In essence, google are leveraging our brand and not giving as a level playing field! Why should I have to pay for an equal direct booking presence ON MY OWN BUSINESS’ search results? If I removed my Google My Business account, they wouldn’t be able to do this – VERY ANGRY at this corporate abuse.